As a responsible Springs Apartments community resident, you know you need to protect your belongings with renters insurance. The question then becomes, "How much do I need?" You don't want to take a loss with too little, but over-insuring can also be costly. It's easy to underestimate the total value of your property. We've compiled a list of expert tips to help you accurately determine the amount of renters insurance you should have. Yes, it's a tedious chore, but well worth the time. No one can be expected to have every possession committed to memory, and you'll be amazed at the amount of items you never would have considered. During your inventory, take plenty of photos, both wide-view and close-up. Be sure to look into closets and storage areas. Experts estimate that most people own at least $3,000 in clothing, and even more if you have a lot of business attire. Store the inventory list and photos in several places, such as in the cloud or on a flash drive, so you have back-ups in case the original set is destroyed. Some insurance companies have online inventory tools. The Insurance Information Institute offers "Know Your Stuff®," a free site that includes storage. There are two types of coverage. Replacement value cost (RVC) reimburses you for current market value to replace your items, regardless of what you paid for them. Actual cash value (ACV) pays out the depreciated value at the time of the loss. ACV policies have lower premiums, but you could end up paying far more out-of-pocket to replace your possessions. Once you have the inventory in hand, start pricing items to determine the difference between actual and current value. Expensive items like jewelry, art or technical equipment are typically covered, but payouts are limited if the items are lost or stolen. If you have valuable possessions of this type, talk to your insurance agent about purchasing a personal articles policy that can provide full coverage. 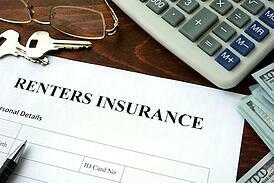 Annual premiums for renters insurance are typically less than $200. That's a small price to pay for peace of mind. Stop by our Springs leasing office if you have any questions for our friendly management team.